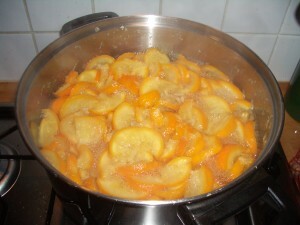 I’m still busy tring lots of things for the first time, and this week it was making marmalade. Last weekend, we were in the market when OH spotted some Seville oranges – I bought a big bag (2kg) for £3.50. I had enough oranges to make two batches of marmalade, and used two different recipes from the River Cottage Preserves book. I made the first batch using the whole fruit method – basically you leave the fruit whole and boil it up for a couple of hours. You then scoop the pips out with a fork and slice the fruit (trying not to burn your fingers), return it to the pan and boil it until it reaches the setting point (about 20 minutes). Unfortunately I misread the instructions didn’t let it boil for long enough and it didn’t set – I had to return it to the pan for another 10 minutes. I made the second batch with the sliced fruit method. With this, you squeezed the juice out of the fruit, slice it and then add it to a pan with the juice and water, leaving it to soak overnight. You then boil it for a couple of hours, before turning the heat up for 20 minutes until it reaches the setting point. 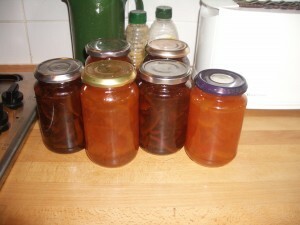 Here are the results – I’ve got around 12 jars of marmalade. The darker jars were made using the sliced fruit method and demerara sugar added – the lighter ones were from the whole fruit method and with ordinary granulated sugar. As to taste, the lighter marmalade is quite sharp – the darker is slightly subtler, but still with a citrussy bite. Have you made marmalade? How did you do it? I’ve made marmalade before using a traditional recipe, but this year decided to go for the whole fruit method.I’d been recommended this technique by several friends who swore by how easy it was, particularly when it came to slicing the oranges. I love marmalade and have made many jars. I haven’t made any this year and really must get on and make some. I have also tried both River Cottage recipes – I like them both but the sliced fruit method just wins for me.